P!NK BEAUTIFUL TRAUMA WORLD TOUR UK and EUROPE 2019! 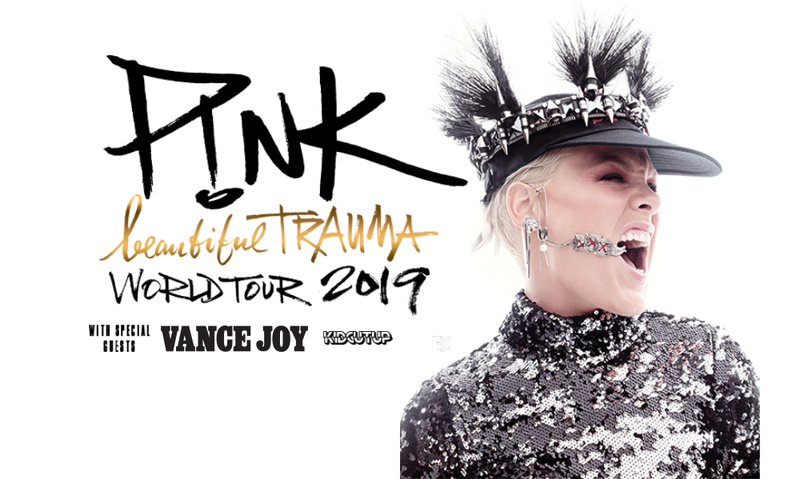 13/12:- Due to phenomenal demand international pop icon P!nk has added two extra dates, Veltins Arena, GELSENKIRCHEN, Germany on 9 August and Mailveld, DEN HAGUE, The Netherlands on 11 August - P!NK Beautiful Trauma World Tour 2019 includes dates for the UK and across Europe for next summer. Famed for her immensely powerful and unique voice and her high-octane live shows, fans are in for a treat when she hits the UK and Europe. Kicking off at The Johan Cruyff Arena (Stadium) AMSTERDAM on Sunday 16th June! - P!NK Tour will also visit the following cities:- Tue 18 DUBLIN RDS, Thu 20 CARDIFF Principality Stadium, Sat 22 GLASGOW Hampden, Sun 23 GLASGOW Hampden, Tue 25 LIVERPOOL Anfield Stadium, Sat 29 LONDON Wembley Stadium, Sun 30 LONDON Wembley Stadium, - JULY Wed 03 PARIS la Defense Arena, Fri 5 COLOGNE Rhein Energie Stadoin, Sat 6 COLOGNE Rhein Energie Stadoin, Mon 8 HAMBURG Volksparkstadion, Wed 10 STUTTGART Mercedes Benz Arena, Fri 12 HANNOVER HDI Arena, Sun 14 BERLIN Olympiastadion, Sat 20 WARSAW PGE 6Narodowy Stadium, Mon 22 FRANKFURT Commerzbank Arena, Wed 24 VIENNA Ernst Happel Stadium, Fri 26 MUNICH Olympiastadion, Sat 27 MUNICH Olympiastadion, Tue 30 ZURICH Leitzegrund Stadium, AUGUST Sat 3 STOCKHOLM Tele 2 Arena Sweden, Mon 05 OSLO Telenor Arena, Wed 07 Aug HORSENS Casa Arena. P!nk will be joined on this tour by special guests Vance Joy, KidCutUp. International DJ Kid Cut Up, has been opening for P!nk throughout her Beautiful Trauma World Tour dates so far. Creating unique remixes and edits, his work has been picked up by radio stations across the US as well as artists including The Chainsmokers, Diplo and DJ Khaled.The hotly tipped, female fronted, British alt-rock band Bang Bang Romeo, described as a “hard edged Fleetwood Mac”, will also join P!nk - To make your night even more special, checkout Official VIP Ticket Experiences including Early Entry GA Standing and great Hot Seats and Premium Ticket and Hotel Experiences - See you there!